So here is a piece I made a while back. I found this brass and glass bottle at the thrift store. At the time of purchase it had a broken music box on the bottom. I actually was able to fix the music box and it plays "How Dry I am". Which I will totally need to use in a future project... 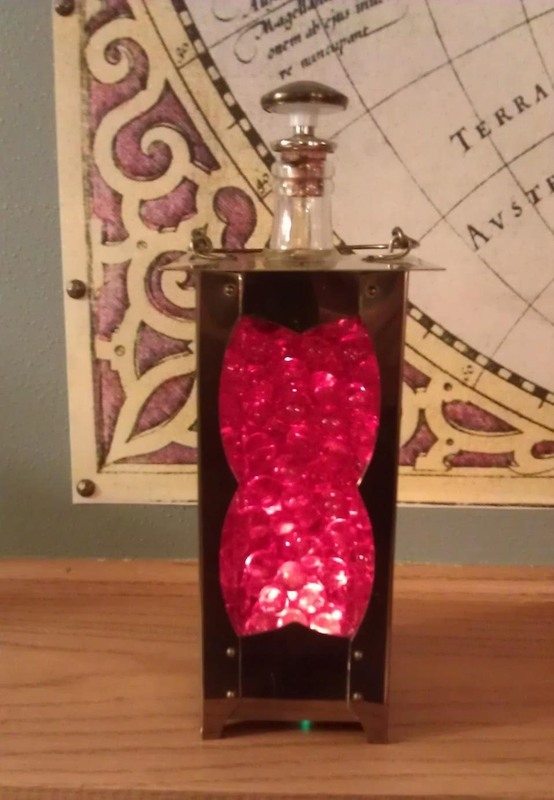 Anyway I had this vision of a brass bottle filled with a glowing red liquid so I mounted a small light below the bottle and filled the bottle with water and food coloring and it didn't work. The light just passed straight through. Damn physics. 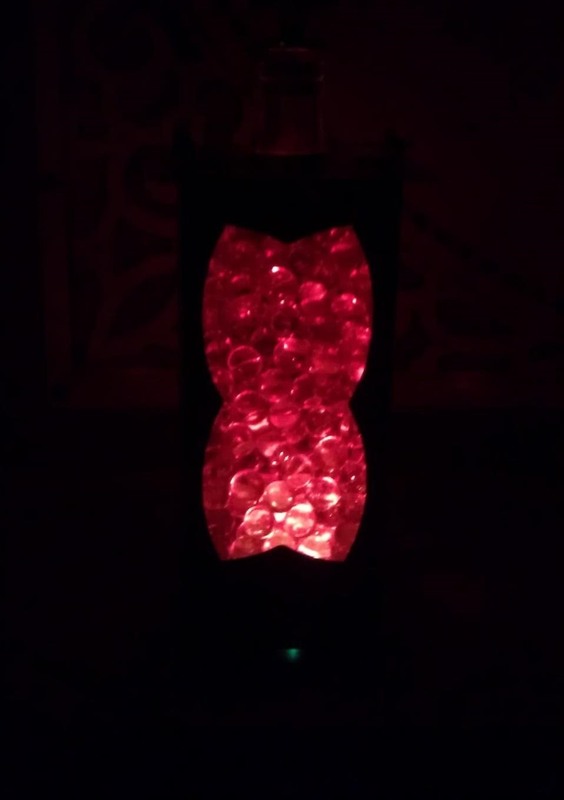 So after thinking about it a bit I added some clear glass marbles to the bottle so the light would have some things to deflect off of. That definitely helped to light the bottle. After I got it done I realized this piece needed a story - or it had a story percolating at the back of my head so below the pretty pictures is the short story "Hannibal's Blood" inspired by this piece. I must warn you though I don't think I've written a short story since high school so it may be pretty rough around the edges. Captain Gerald Foster shook his head as he assessed the state of his jacket; this adventuring was playing absolute hob with his wardrobe. The rough stone chute to the lower level of the temple may not have been the most elegant way down but it was by far the most expedient they had found so far. "I'll be down to my gardening trousers in a month at this rate" he muttered to himself. "Did you say something Captain?" called down the Baroness. "That woman has ears like a bloody bat." Captain Foster thought quite loudly but making quite sure that not a syllable escaped his lips. "Should I send the lantern down?" she enquired. Gaining the ledge at the edge of the pit trap Gerald attempted to reach for the torch he had dropped down the shaft as it sputtered near the cruel sharpened stones at the pit's bottom. Whoever it was that built this temple, Gerald decided, they were not a nice people. No wonder we couldn't get any of the locals to come up here he thought, the elders in the village had the right of it – this place is literally a death trap. Giving the torch up as a lost cause Gerald stood and brushed the dust and cobwebs from his pants. A faint red glow began to fill the adjacent chamber to where Foster currently stood. "Wait a moment your Excellency" he called up. Drawing his Colt revolver the captain eased into the next room. The glow became noticeably stronger. The rough stone chamber, Gerald noted with a quick glance, held several disparate items: one simple unadorned stone alter, one broken urn, one clear glass bottle giving off a steady albeit malevolent red glow, and one corpse. At first Captain Foster thought that the sandstone lower crypt was being cooled in some fashion, but with a start he realized that it was his very flesh that was becoming chilled. Quickly stepping back into the next room the heat and humidity of the African air descended upon him. His face and hands burned as if he had come into a warm room from being outside too long on a bitterly cold night. The glow from the bottle slowly and sullenly faded. "Captain Foster what in blazes is going on down there?" echoed the Baroness' voice from the top of the tunnel. "Do you need assistance?" "I am all right for the moment your Excellency." Gerald called up rubbing his hands together to clear the last of the chill, "but what was the name of that fellow that you were so concerned knew the location of this artifact?" "He went by Francis Swinton; he was a fairly well known artificer in some circles." the Baroness called down "Is there some indication that he has been in the sub-crypt?" "Perhaps," replied Foster "Did he have a penchant for brown tweed?" "Captain Foster!" the Baroness barked "What does that have to do with anything? I'm coming down this instant!" "Your excellency," the Captain replied, "before you descend please bring Dr. Turnbull. I would very much like his opinion on the current situation; things appear a bit… precarious in the sub-crypt." "Suit yourself Captain," the Baroness huffed, "I will return shortly." Damnation, Gerald thought to himself as the friendly glow of the lantern receded from the top of the chute leaving him with only the fitful red glow of the adjacent room and his guttering torch, I should have had her send down the spare lantern. After a short interval, that felt much longer in presence of something most likely dangerous to his person, Gerald could hear the clomping steps of Dr. Turnbull approaching via the upper crypt. Accompanying the doctor's steps was a running tirade from the Baroness--"Really doctor I am at my wits end with that man. I've hired on this crew to complete a specific job and at the prices I am paying I expect professionalism above all professionalism!" Gerald smiled to himself; much like a rock in a surging river the tirade seemed to have little effect on the good doctor. It will take a very long time to wear down Dr. Myron Thaddeus Turnbull my dear Baroness, Gerald thought to himself. "Oy laddie what have you found?" called down Myron. "I believe I've discovered the artifact Doctor, but there are some complications that I could use your professional opinion on." Gerald called up. "Ooh professional is it?" the doctor quipped "Well then I'll be right down." Accompanied by a ratcheting sound Dr. Turnbull's stumpy form slowly descended the chute. With an oath he pulled up short when his lantern revealed the sharpened stone spikes at the bottom of the pit. "A bit of hand if you would lad" called the doctor. Leaning over Gerald grabbed the front of Myron's leather airship harness and pulled him to the pits ledge. With his feet planted on solid ground the doctor pressed a brass button on the device attached to his harness. With a final loud whirr and clanking the device released the rope. Returning the climbing device to one of the many hooks on his belt Turnbull stretched until there was an audible crack of his back "Oof," he exclaimed. "Much appreciated my good captain, so what is it you needed my most expert opinion on?" the doctor asked with just the slightest wiggle of his eyebrows. Captain Foster smiled as he took in his friend. Standing just a bit over 5 feet in height the doctor with his bushy muttonchops would have been comical if not for the broadness of his shoulders and the muscle packed onto his short frame. Although in fairness the doctor's fashion sense was also something one had to become inured to; the combination of a vest and kilt made of heavy canvas along with a bowler was quite enough but when you added in the ubiquitous gadgets and tools strapped to his broad leather belt, he was a walking tinker's cart. "I say Myron, I understand that your kilt would be comfortable in this heat, but shouldn't it be a Turnbull tartan and not made of canvas?" "Oh, aye lad the airflow is welcome if you know what I mean" remarked Turnbull," but I'll be boiled before I let some jumped up weaver tell me what to wear when! So onward and hopefully upward, what do you have for me?" Just as Gerald was about to answer there was snicking noise like the combination of a bat flittering about and a knife being drawn from a sheath. Both Myron and Gerald turned to observe a small clockwork owl alight on the pinnacle of one of the stone spikes. "WHO-nic, WHO-nic, WHO-nic" it softly called as it turned it's lantern like eyes on the two adventures. "Make yourself presentable lad," drawled Myron, "Her highness approaches." "Careful doctor," Gerald whispered pointing up the chute, "ears like a bat." With more grace than either of the men the Baroness, rappelled down the rope to a point just above the sharpened spikes. Pushing off of the back wall with her legs Saundra swung across the pit landing in a three-point stance on the ledge. Gerald briefly admired the cleavage that this maneuver exposed before offering an arm to the dark haired baroness. Waving him off Saundra regained her feet and brushed nonexistent dust from her split skirt and armored outer corset. Within moments the little metal owl alighted on the baroness's shoulder and settled in. Adjusting her round pith helmet and accompanying white veil the baroness pinned both the captain and the doctor with her dark brown eyes. "Gentlemen?" she enquired with a wave of her hand indicating that an explanation of the situation should proceed both quickly and succinctly. Clearing his throat Captain Foster took charge of the situation. "Ahem, yes your Excellency if you will both please follow me." Gerald led both the doctor and the baroness to the entrance of the next room. "Be careful not to cross the threshold," he stated in a low firm tone, "I believe that the artifact has been damaged and become unstable." As the trio stared into the sub-crypt the Baroness whispered, "Bubo please be a dear." With a soft hoot and the whir of gears the light from the eyes of the small owl intensified until their output was like that of two electric torches. As sufficient light exposed the room the Baroness hissed, "Damn you, you arrogant and foolhardy man." "Excuse me?" asked Captain Foster. "Not you…this time," replied the Baroness, gesturing with hand at the scene before them of the broken pottery, device, and corpse. "I would bet good money that before us lays one Francis Swinton, and his failed experiment to harness the power of Hannibal's Blood through the use of Bachellise's hypothesis on malign dissipation." "Good eye lass!" the doctor interjected excitedly, "I do believe your assessment is correct." He hurriedly grabbed down a set of goggles strapped to his hat and placed them over his eyes. With a few deft adjustments to the small dials on the goggles' sides he began to mutter to himself as he peered into the room. Gerald, his head snapping back and forth from this rapid fire exchange like he was at a tennis match finally looked to the Baroness for explanation. "Your Excellency, Bale-cheesy who?" he enquired. "Bachellise," she corrected. "He was an Italian priest from approximately 200 years ago that had some experience with artifacts, especially those of a malign influence. One of his hypotheses was that with the proper application of a grounding force much like that of a lightning rod the dangerous emanations from such relics could be cancelled out. But it appears that the hypothesis has been proven wrong" the Baroness concluded gesturing towards the corpse. "I'd not be so quick to jump to conclusions," the doctor interjected, "I believe the hypothesis was sound – it's his welds that I question." Taking off his goggles Myron offered them to the captain. "Take a look at the top right hand side of that brass frame Gerald, and tell me what you see," the doctor instructed. Gerald donned the goggles and quickly adjusted the dials to get a close-up view of the brass device. "It appears Myron has the right of it your Excellency," Gerald remarked handing back the goggles, "there is a broken weld at the top of the device." "Do ya think you can command your wee beastie to fly in the room and reattach the wire?" Myron enquired of Saundra. The baroness paused before answering, "Well, I'm not sure Dr. Turnbull. My ability to control the aetherium at a distance may be affected by the emanations from the artifact." Myron detected a bit of prevarication in this answer, but decided not to pursue it. "Well your excellency if you could but try?" he asked. Saundra closed her eyes and the small metal owl shuffled from her shoulder down to her wrist. Taking a step back from the archway the baroness flicked her arm upward much like a falconer launching a hawk. The owl circled the outer chamber twice before heading for the opening to the alcove. As the owl reached the threshold it let out a loud metallic shriek and fell to the floor. Saundra clutched at her heart and almost swooned. Careening to the doorway she snatched the owl up and stumbled off to the side of the antechamber. Sliding down to the floor she clutched the owl to her chest. Gerald and Myron looked at one another with identical raised eyebrows (albeit one pair was much bushier). Neither had ever seen the normally unflappable lady so distraught. Gerald quickly moved to the baroness's side to somehow salvage the situation. While the captain was distracted Myron took a deep breath and stuck his prosthetic hand and arm through the doorway. Expecting to feel a shock or at least lose control of his brass and aetherium limb he was a bit surprised when neither happened. Waggling the fingers of his artificial left hand he then stuck his right hand past the doorway, and immediately snatched it back. It felt as if he has stuck his hand in ice water. The bottle in the chamber flared with light, briefly. Myron's eyes narrowed as he looked over at the baroness. Neither she nor Gerald had noted his impromptu experiment. You've got secrets lass, the doctor thought, I just hope they aren't the kind that get us all killed. "Right then," Myron stated making a hand gesture to Gerald to continue to see to the baroness while he busily searched around his person for the right device. "Looks like this may be a job for man's oldest tool." Seeing the quizzical look on Gerald's face Myron sighed, "A stick lad, I'm looking for a stick, actually a telescoping rod to be precise. Ahh, here it is" Myron exclaimed pulling a fat brass tube from one of his many pockets. Making sure he had the device facing the correct direction Myron pressed a small button on it. With a pop like a large party cracker sections of the tube began to extend until he was holding a stave a little over 12 feet in length each section just a bit smaller than the one before it. Bracing the rod against the side of the doorway Myron carefully pushed the loose wire back into place. Gritting his teeth Myron moved his right hand passed the threshold once again. This time there was no response from the bottle. "That seems to have done it Captain," Myron remarked turning to look at the pair. By this point Saundra had regained her feet and was now brushing real dirt off of her clothing. The small owl sat hunched and yet somehow wary on her shoulder. "Yes captain," she replied, "I'm quite sure I am all right now you can stop fussing. The artifact just gave me a bit of a start. There must have been some sort of reaction with the aetherium… I believe that I will return to the ship for a while. You gentlemen appear to have everything in hand now." "Yes, of course your Excellency." Gerald stammered as the baroness brushed past him. Taking a device similar to Myron's from her belt Sandra attached it to the rope at the edge of the chamber. With a ratcheting noise her lithe form was quickly drawn up the stone chute and out of sight. Leaving the edge of the pit trap Gerald returned to the doorway. "Good work doctor," he stated making his way into the chamber. "Should we nab the little devil and be off?" Myron's metal limb shot out faster than the eye could follow nabbing Gerald's arm as if in a vice. "Captain that metal is making the most tenuous of connections at this time. I suggest we get Adelaide and also bring down the containment box. I'd rather not wind up like poor old what's his name there." Gerald groaned as he thought of the two tasks now before him. "Myron," he complained, "that box weighs close to 700 pounds if it weighs an ounce, and waking up Adelaide is never a job to be taken lightly." Myron chuckled as he answered, "Come now laddie, the safety and health of your crew are paramount to the ways of captaincy. Anyway," he continued casting a glance over to their way out of the lower chamber, "You have a penchant for dangerous women." Gerald spluttered but then laughed in spite of himself, "You're too shrewd for your own good Myron, but it'll take the three of us maneuver that blasted box down here so you might as well accompany me topside. Anyway it will most likely take the well-honed bedside manner of a learned man such as yourself to wake that Cajun spitfire without bodily harm." "Alright then lad," Myron quipped as he marched over to the rope compressing the telescoping rod and placing a fresh black powder cartridge in its breech. Looking down at the device he smiled, "At least I can poke the bear from a safe distance, and let her know it was on your orders." Having the last word the doctor snapped his brass ascender to the rope was quickly whisked out of site. Gerald's back began to ache just thinking of the work that would be needed to manhandle the containment box down here and for a moment was tempted to just grab the damn bottle and be done with it, but he could still picture the rictus grin of one Francis Swinton lying just feet away and decided to clamp down on that impulse. Why can it never be easy? I think you could mix up red gelatin or something for a smoother effect.. Also, I would be more interested in pics/explanation of what you did to fix the music box. Music box was a pretty easy fix. Just cleaned the dust out of it and gave it a liberal dose of 3-in-1 oil.